Normally in these posts, I do a comparison between the DIY and the machine to figure out how to save money. However, in the case of the washing machine, I won’t even bother doing the comparison between hand washing all your clothes and using the washing machine. 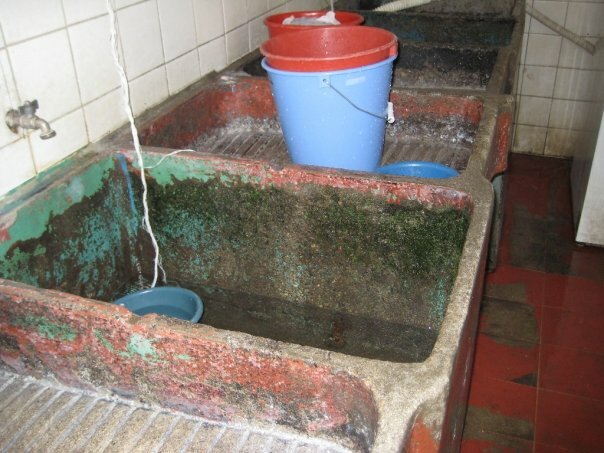 On a service trip to Guatemala in 2009, I had the pleasure of serving an orphanage by helping the nuns hand wash bed sheets (see left). After that experience, I realized the full extent of labor and time savings that washing machines make possible. So, assuming you’ll be using the washing machine, the question is what cycle should you use to wash your clothes. Every where you look, it is easy to find which cycle of your washing machine the makers recommend you use. “Use ‘Whites’ for white garments. 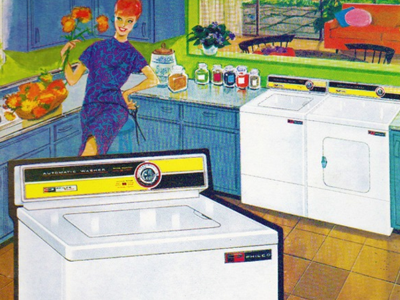 Use ‘Brights’ for bright garments,” the washing machine manual drones. However, for a savvy shopper who would like to save money on laundering, this simply stated explanation just doesn’t cut it. Each washing machine is different, which makes it difficult to talk about the cost of washing machines or even washing machine cycles generally. Some models are controlled by one central dial featuring options like “Cotton” or “Colors” while others have an array of knobs featuring customizable heat, speed, or even duration. Some models are top-loading machines with large tanks, others are front-loading washers using less water. Meanwhile, the main cost of a washing machine is heating the water, a task most commonly performed by your water heater rather than your washing machine. This makes the thermostat setting of your water heater as well as the ground temperature essential to determining the cost of your washing machine. Owing to lead-poisoning concerns, people should never drink hot tap water. That’s why the primary route to respiratory disease from these germs comes through inhalation of the steam associated with showering or hot tubs. Infections due to these home-grown germs are estimated to kill 3,000 to 12,000 Americans annually, Edwards says. Furthermore, if your dishwasher and washing machine don’t preheat water, then hotter temperatures are required to sanitize dishes and clothing. As a result, 140°F is recommended in those cases, since 140°F is the bottom of the recommended range for killing bacteria. Hotter temperatures may work even better, and 165°F is considered sufficient. So in my estimations below, we’ll assume: a top-loading washer that has both a 20 gallon rinse and a 20-gallon wash cycle, thus using 40 gallons of water for each load; a ground temperature of 55°F (average in Virginia); a water heater thermostat set at 140°F; and a cost of $2 / 1000 gallons for water and $0.11 per kWh for energy. To estimate energy costs of heating water, I’m using this online calculator. That being said, let’s review the basic settings of your machine. There are two things going on in your speed setting. One is the level of agitation and the other is the speed of the spin cycle. The agitation is a major part of how your clothes get clean. All the friction of your clothes rubbing against one another is what helps create soap suds and deep cleans your fabrics. The higher the agitation setting the cleaner your heavy duty clothes will be, but also the more damage your delicate clothing acquires. In general, the proposed theory is faster agitations for thicker clothes, slower ones for thinner ones. The spin cycle is an attempt to save money on your dryer bill. The spin uses centripetal force to remove water from the clothing. At best, this cycle makes your clothes barely damp. At worst, they are dripping. Slower spins means wetter clothes, which means longer drying time, which means more money. Some clothes get wrinkled in the spin cycle though. Others can get stretched out if the spin is too forceful. Thus, lesser spin settings must get chosen sometimes. Most machines don’t just let you choose your agitation and spin settings, instead they let you choose programs, like the ones below. Normally the topmost setting is Heavy Duty, which is high agitation and high spin. It is intended for durable, sturdy fabrics. The high agitation is especially effective for heavily soiled loads. Towels are the classic examples. If it is listed centrally on your settings dial, Regular normally means low agitation and a high spin. However, if it is the topmost one listed, it is almost certainly high agitation and a high spin. On my parents washing machine, it is the former. On my new one, it is the latter. Regular is anything but a standard setting. Your best bet is to look it up in the manual. Delicates is a low agitation, low spin setting. While Handwash is either extra low agitation or intermittent low agitation with a slow spin If there are two Handwash settings, Handwash Casual is extra slow agitation while Handwash Delicates is intermittent extra low agitation. As far as I can tell, there is not a substantial difference in operating cost between any of these spin settings, meaning that in choosing one setting over another you are not making a substantial energy cost decision. Instead, the cost of these settings comes from the level of damage to your clothing. Putting delicate clothing under high agitation levels can result in needing to replace your clothes more often, thus making it more costly. However, if your clothes can take it, a higher spin setting will result in more savings on your dryer, which is the real cost to you in laundering. Depending on the machine, each setting may have one or two temperature types. If it has two, the first one is the wash and the second is the rinse. In the case of “Cold – Cold,” that would be a cold water wash followed by a cold water rinse. The rinse temperature is normally the same if not colder than the wash temperature. If a rinse temperature is not listed on your machine or you cannot choose it, the chances are it is either always a cold rinse or the same as the wash. Normally your manual will say, but some manuals (like mine) neglect to mention. The Cold setting normally means no heating is added. This means that the temperature of your ground water is the temperature of your wash. As a result, there is no extra electricity fee, you are just paying for the water itself. At $2 / 1000 gallons, the cost of a Cold water wash would be $0.04. In Virginia, it is estimated that our ground temperature is between 55°F and 57°F. In either case, it is actually lower than the lowest setting recommended for normal laundry soap usage. According to WashLaundry.com, “The lower the temperature of the water, the more detergent you need. If the temperature of the water is below 60°F, no soap or detergent performs well.” Even my washing machine manual warns me against washing my clothes in water below 60°F. One solution to this problem is buying a laundry soap intended for cold water washes. Such laundry soaps say on the container “Coldwater Liquid Detergent” and is made by many of the big name soap brands, such as Tide. The coldwater detergent costs $0.15 per ounce, the same as regular detergent. If you run a cold-cold cycle, the total cost would be $0.08 per load. The “Colors” and “Delicates” cycles are normally Cold-Cold. The Cool setting is a cold water wash and rinse where hot water is added to make the water temperature above 60°F so regular detergent performs well. It is a setting only available on washing machines that also have either temperature sensors which can regulate the flow of hot and cold water over the course of the cycle or have their own heating element to adjust the temperature before it enters the tub. The former of these two options is often the cheaper one. My washing machine’s cool cycle keeps the temperature at 70°F. Assuming a ground temperature of 55°F, that makes the cool wash cost $0.13. If it is a cool-cool cycle, then the total cost would be $0.26 per load. If it is a warm-cold cycle, then the total cost would be $0.37 per load. If it is a warm-warm cycle, then the total cost would be $0.58 per load. If you have a machine with a temperature sensor, then the load is likely not an exact 50-50 split but rather a regulated temperature setting. Your manual may say what temperature this is. Hot water is often just 20 gallons of water straight from the hot water tank (140°F). With a ground temperature of 55°F, this costs $0.53. If it is a hot-cold cycle, then the total cost would be $0.61 per load. If it is a hot-warm cycle, then the total cost would be $0.82 per load. If it is a hot-hot cycle, then the total cost would be $1.06 per load. If you have a “Sanitize” cycle, it is normally at least a hot wash cycle and sometimes has a hot rinse cycle as well. The “Quick” cycle is also hot water, but is a shorter wash. According to How Stuff Works, “Prior to the invention of laundry detergents, Americans used soap flakes to wash clothes.” However, nowadays we have surfactants, or “surface-active agents.” With one end that is attracted to water and the other attracted to oil, this molecule hunts out grease and grime and then draws it out of fabrics as it follows the water down the drain. Furthermore, there are often enzymes added to help break down proteins and fats, especially useful for removing food particles. In water below 60°F, all these chemical reactions are slowed. That’s why there are also coldwater detergents available. According to Tide, who currently owns the leading coldwater detergent, coldwater detergents contain ” an increased amount of surfactant chemistry” as well as “an increased amount of polymer technology ” (which helps “to suspend dirt particles to help prevent them from redepositing on fabrics”). By making the detergent highly concentrated with these agents, the idea is that even if each is slowed from colder temperatures, the detergent can still maintain the same level of effective cleaning. Furthermore, if you have a “high efficiency,” front-loading washing machine, there are detergents made specifically to have fewer suds. Also, because there is less water being used in a HE washer, there is a normally higher soil content in that water. As a result, HE detergents have more polymer technology for suspending the dirt in the water once its pulled out of your clothes. All these kinds of detergents discussed above end up being approximately the same price (although store brand alternatives do tend to be cheaper) at $0.15 per ounce (which is 1/8 cup). One load of laundry tends to require 1 oz, give or take a little. However, Tide estimates you using 2 oz (or 1/4 cup) per load, which would be $0.30 per load. Using that much is probably not necessary, but can vary based on your water hardness and temperature. Both scoops are filled with 2 ounces. For the larger one, this is its second fill line. My mom has been buying the same brand of powdered detergent for a while. A few years ago, the company tripled the size of the scoop (see right). It’s only on further inspection that you can see the recommended fill line on the new giant scoop is way down on the bottom. I’m sure many people put a lot of detergent to waste, not to mention potentially got soap residue on their clothes, from this scoop’s size deception. 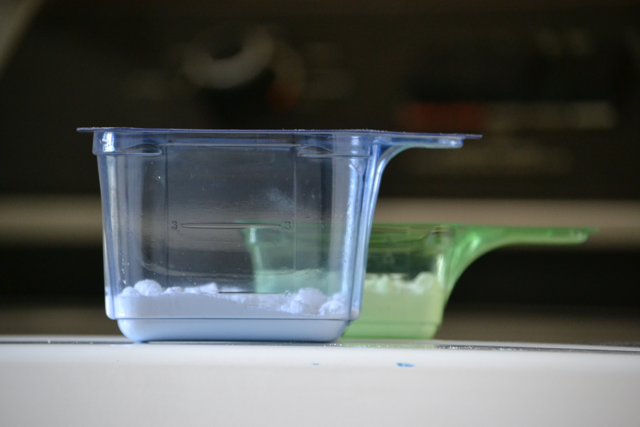 If you’re worried about using too much, dedicate a measuring cup to your detergent. Measure out 1/8 cup. Compare that amount to your scoop or cap even so you can see where the real fill line should be. There is also the homemade option. Trent Hamm at The Simple Dollar, for example, has shared a basic homemade laundry detergent recipe. The gist of the instructions is to boil water; grate a bunch of bars of soap into bits and dissolve it in the boiling water; mix with more water, borax, and washing soda in a bucket; and then let it sit for 24 hours with the lid on. In 2008, he says that his recipe costs $6.97 per 6 batches, making it $1.16 per batch . One batch is 52 cups (416 oz). He recommends using one cup per load, which places the cost at $0.02 per load. He compares his detergents ability to remove mustard to Tide’s. Both detergents failed to truly make the stain go away on their respective shirts, but both succeeded about the same amount to make the stains not noticeable. So, Trent concludes, it’s not a perfect mix, but it’s as good as Tide. A few years later, Trent also shared a powdered detergent recipe that is very similar. The gist of those instructions is grate a bar of soap and then mix it with washing soda, borax, and oxygen cleaner in a Ziploc bag. This detergent only requires 2 tablespoons, but is likely better for warmer water. Soak is when the water is filled to a certain water level, sits for a period of time, and then is drained. There may be mild agitation, but frequently there is not. Soak is used if you’re pre-treating stained or soiled clothes. If your stain remover says you should soak it before washing, this is one way of automating that task. It likely uses the same amount of water (20 gallons in our example case) and in most cases, you would want to use cold water, although you can pick any temperature. If you do choose cold, that would make it cost $0.08 extra. A Pre-Wash, on the other hand, is a wash cycle (fill, agitate, drain). Sometimes, the pre-wash can continue into a Soak or continue into a normal washing machine cycle. Again it uses 20 gallons of water whatever temperature you want it to use. The timer knob then has several differences in timing settings. Mine has Super Wash, Heavy, Regular, and Light, for example. Each of these are a wash, followed by a rinse, followed by a spin. The difference is how long the wash lasts. Frequently a number will follow some or all of these. On mine, it reads “Regular 10” for example, which means it is a 10-minute wash cycle. The whole washing machine will take longer than 10-minutes, since there is also a rinse and spin cycle, but the wash determines how much agitation the clothes will receive before the water is drained. More agitation may be required if clothes are heavily soiled. Less may be desired if you’re worried about damage. For example, if you’re doing a load of lightly soiled garments using the handwash setting, you may want to choose Light, instead of regular, for the wash. Extra Rinse is sometimes an option you can turn on independently and sometimes an option you can run all on its own. If you also have an extra rinse knob, then the wash-rinse-spin setting will be followed by yet another rinse. This rinse is used to confirm that all the soap is removed from your clothes. The Quick Wash cycle is intended to be a wash for when your clothes aren’t that dirty or they need refreshing before you’d like to put them on. If you’ve left your wet clothes in the washing machine for a long period of time, a Quick Wash setting will help also wash away any odd smells, mold, or mildew. It is a wash-rinse-spin cycle, which has a shorter rinse. The rinse uses less water, which means it might leave more soap in, so putting less soap in will help your clothes. Some people recommend putting lemon juice or vinegar in the rinse part of Quick Wash cycles. In addition to the obvious difference of one providing extra counter space by loading from the front and the other giving you the comfort of not having to bend over, there are actually a lot of differences between front-loading and top-loading washers. Top-loading washers have a large agitator in the middle of their basin, which agitates the water, shifting the clothes in it until they are clean. Front-loading washers allow gravity to provide the agitation. With less water and more tumbling, a special soap is required (as mentioned in the detergent section), but it has been suggested that less damage is done to your clothes, since there is no agitator beating against them. There also exist high efficiency top-loading washers which, like front-loaders, do not have an agitator. While a top-loading machine requires enough water to cover all the clothes in its drum, a front-loading washer needs only a third of that amount because its drum is set horizontally in the machine. As the drum turns, it uses gravity to drop the clothes back into the water. And while a top-loading machine will empty the soapy water and refill for a rinse agitation cycle, a front-loading machine just sprays clean water on the load as the drum continues to turn, saving gallons. Top-loading washers have a shorter cycle which uses more water. While front-loading washers use less water (which is more saturated with soap) and turn your clothes through that water for longer. Although some people claim that the front-loading washer also can hold more clothes, the general consensus is that when comparing similar basin sizes, front-loading machines actually hold less. If you fill the basin to capacity, the wash cycle won’t actually provide enough water to get all the clothes clean (sometimes not even enough to get it all wet). This is because if front-loading washers did provide enough water to clean a full load, the machine would likely leak its water out the front. However, some front-loading washers have large enough basins that they can still wash as much if not more than older top-loading washers with large agitators. And many believe that blankets and comforters are cleaned a lot better in front-loaders with no agitator, since the bedding doesn’t get rolled, knotted, and then beaten by the agitator. As a Virginia appliance repair company, we know that front loaders may require more maintenance. Common issue with them is a musty smell due to leftover water and lint accumulating inside the machine and causing mold growth. To eliminate it, it’s recommended to keep the door open when the appliance is not in use and regularly clean the rubber seal. At the end of the day, most reviewers say that front-loaders, when they work properly, are better, but for every family that has a success story it seems there are three with horror stories. Who knows which is better? Since front-loaders sometimes restart themselves, draining their water and starting the cycle over with new water, who is to say which saves money? There are a few items which likely need to be disinfected: cloth diapers, underwear, baby blankets, the clothes of the sick, thrift store purchases, aprons (when used with cooking meat) as well as cleaning cloths and towels, particularly those used in the bathroom. These items either regularly or semi-regularly need to be washed in hot water, if possible, for health. Furthermore, things with oil stains like sweaty clothes are better washed in hot temperatures (and pre-soaked or washed as soon as you’ve taken them off). If the average family is like mine, they have three distinct types of loads: a load of cold water delicates, a load of regular clothes, and a load of towels / bedding. The last of these can be done the least frequently. The average family does 116 loads of laundry per person. That means they are doing 2.23 loads of laundry per week. Assuming the rinse cycle is always cold…. Doing everything in cold (or cool) water would be $9.28 per year ($30.16 for cool). All warm would be $67.28. All hot (although you’d likely destroy your clothes if you did this) would be $70.76. The savings for switching from this balanced approach to an all cold (or cool) load would be $32.36 per year ($11.48 per year for cool). However the cost is the potential bacteria growth on your fabrics. Clearly, washing your clothes at least sometimes in hot water would be healthiest. As a result, if instead you did your delicates every week on cold, your regular clothes most of the time on cold and once a month on hot, and then your bedding / towels once a month on hot, then it would cost $22.00. If you did the same thing but washed your bedding / towels on hot only every third month and cold during the other months, it would cost $17.76 for an additional savings of $4.24 or $35.76 if using cool for an additional savings of $2.80. Note: If you do wash your clothes mostly in cold water (rather than warm or cool), you probably should invest in a cold water detergent. If you can combine your cold delicates and cold regulars on the weeks you wash cold and could combine your hot regulars and hot towels on the weeks you wash hot (only doing 64 loads), it would cost $11.48 or $20.84 for cool. So clearly it’s cheapest do wash your clothes on cold almost all the time, but what is the minimum amount you should wash your clothes on hot? Well, on the one hand, if you’re hot water heater is set below 140ºF, then it’s may not be worth washing hot anyways, it won’t kill all the germs. However, on the other hand, it may not be all the germs, but it is still more than cold water. If you’re doing a load that could take bleach, that can be your disinfectant and you can avoid hot water all together. At $0.04 per ounce, it it cheaper than every washing machine cycle. Color safe bleach is a bit more expensive at $0.21 per ounce, but it is still cheaper than hot water. If you are line drying your clothes, the sunlight is a natural disinfectant, which means you don’t have to worry as much about killing germs in the washing machine on a sunny day since the sun will kill them outside. This is a relatively free solution, although there are minimal hidden costs to line drying. If you do choose to wash all cold, you should know that there are consequences to having infected clothing, towels, and bedding. Urinary tract infections are linked to dirty underwear, frequently underwear which is only washed cold. If you find yourself getting sick more often after switching to all cold water, try a new disinfectant strategy. Furthermore, be sure to wash your washing machine periodically with bleach, even if it is just an otherwise empty load. Apparently, washing machines, especially those that only use cold water, are frequently covered in bacteria, which spread from load to load. Several new “sanitizing detergents” which contain bleach but are effective in cold water are now on the market. While regular detergent killed most but not all of the three bacteria strains (including E. Coli) tested at all three temperatures, the sanitizing detergents killed all three types, even in cold water. I found this type of detergent very hard to find. So, if such a thing does exist, their marketing department hasn’t succeeded yet. However, you can do the same thing as this detergent at home by using cold water detergent and bleach (color safe if needed) in your loads of laundry. Doing all cold water laundry would cost $9.28 per year for the average American. Adding bleach each time adds an additional yearly cost of $4.64, for a total of $13.92. That’s a savings of $27.72 annually over the more balanced approach using each of the temperatures. Some people may have the luxury of not being penny pinching. Others should think a lot about the money that goes into their regular bills and routines. This article is intended to assist those who are trying to find places to save.